Most business crowdfunding platforms offer returns on the investment, but this has none — it is simply a gift. George said the individual gifts will be small, in the $50 to $250 range. The platform can be linked to wedding and baby registries. “You’re going to spend $250 on a coffee making machine? If that $250 goes to a down payment of your home, at the very least, I improve your quality of life and the second thing I do is I give you some, today, some tax deductibility,” George added. As an incentive for encouraging prospective homeowners to attend credit education courses and counseling, borrowers can also receive grants of up to $2,500 once they’ve completed the free classes. After that, the platform will match donations at $2 for every $1 raised, up to $2,500. On the other side, contributors are also assured that the money will in fact go to fund the home purchase and can make their gift conditional on that. The idea is not just to raise money for the down payment but to add to the borrower’s existing funds. This can help eliminate the need for mortgage insurance, which is required on very low down payment loans. Fannie Mae is calling it a “pilot project,” and will be watching the results closely. Crowdfunding your way into home ownership. Here’s how from CNBC. Those with less skin in the game are typically the people who have the most trouble in a down market. Apparently, the potential profit must be so large that the investors overlook that – or figure there is little chance the government will let the market go down again? Several years after her divorce, Tricia DeWaal was still living in the 3,200-square-foot home where she’d raised her children. When her youngest moved out, DeWaal knew it was time to downsize. After lots of online research, DeWaal came across a company called Unison, which had an intriguing sales pitch. The company’s home-buyer program offers buyers money for a down payment in exchange for a share of equity in the home, to be paid back when the owner sells. DeWaal had what she called a “very positive experience.” “It’s definitely a good thing for somebody who’s trying to afford a certain amount that they can’t quite get to,” she said. 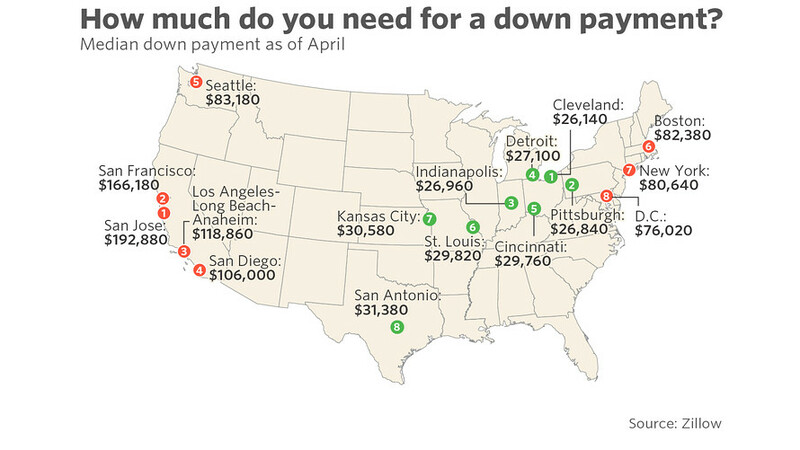 Homeownership’s biggest barrier to entry, the down payment, looms larger and larger all across the country. Student debt payments and high rents are formidable barriers to saving, and, while there are plenty of ways to buy a home with less than 20% down, all require some form of mortgage insurance, making them more expensive. For a long time, nonprofits have tried to help home buyers up and over the hurdle. But in today’s tight market and constrained lending environment, fintech companies are seeing an opportunity as well, particularly in the hottest housing markets, where 20% down can mean six figures. Unison and a competitor, OWN Home Finance, which is set to launch a similar product later this year, got started years ago with a slightly different business model: allowing homeowners with high levels of accrued equity a means of tapping into that money. Here’s how Unison’s model works: The company contributes up to 50% of the down payment, or 10% of the total cost of the home, and, then, when the owner sells, Unison takes a share of the profit, usually 35% — or a share of the loss, also usually 35%. For many housing market observers, the idea makes a lot of sense. Still, with programs like these, according to Theodos and other experts, the devil is in the details. There’s been a lot of hullabaloo about the Fannie/Freddie decision to drop the minimum down payment from 5% to 3%. But the 2% difference will have virtually nothing to do with the decision to default. If a homeowner is going to walk from a 3% down payment; they will walk from a 5% down payment too. According to recent data from the National Association of Realtors, first-time homebuyers account for just 33 percent of all home purchases. That’s the lowest level in 27 years. “Maybe there’s a cultural change. Our millennials spend more time on Facebook than standing over the backyard fence and talking to the neighbor,” Shiller said, attempting to explain the drop in new homebuyers. The media keeps publishing their usual fear-mongering, wanting you to believe that as soon as the investors pull out, the real estate market will tank. It could be a factor in some of the lower-end markets, but there are plenty of first-timers and low-down-payment buyers being shut out by Big Cash. They will have their chance if the investors bail, and may have to pay a little more. How’s the investor action around NSDCC? Based on the mailing address on the tax rolls, 79% of the buyers stated that they live there (21% have their mail sent elsewhere). Of the 90 sales, 72 of them used at least a 20% down payment. Of the 90 sales, 8 were all-cash, and five used at least 50% down. Only five of the 19 non-owner occupiers paid cash. Only two of the 19 NOOs were corporation/LLC names. Six of the 90 were the retail end of a flip. Seven were short-sales, and 2 were REO listings. Seven included the buzz phrase “won’t last” or similar. There might have been a handful of flippers or short-term investors in that group, but that sounds fairly normal. Investor activity is in every market these days, but the vast majority of sales are completed by folks who are living there – and probably in for the long haul. There are plenty of those still waiting too, so prices may ebb and flow, but if investor activity slows or stops, it will only give more owner-occupiers a chance to get in. Are long-time owners, mostly empty-nesters or elderly, finally moving on? Or is it more of the recent peak purchasers who are cutting loose? Of those who are selling now, when did they buy? I thought there would have been more long-timers based on how many estate sales I’ve seen lately, but sellers don’t have to be long-time owners to be old. Those who bought prior to 2004 ended up selling for more than they paid, though that doesn’t mean that they walked with money. How did the sellers who bought since 2004 make out? There were some heavy losses too, fourteen sellers lost more than $300,000. There were 19 short sales and 5 REO sales, so about 40% suffered their losses personally. The local market is setting up for an extended period of quiet. Buyers continue to use big cash deposits and are financing the rest at such low rates that their resulting payments should be very manageable. They must be in for the long haul. There were 77% of the buyers who used at least 25% down payments in the last month. There were 12 trust/estate sales, 4 short sales, 7 REO sales, and 23 sellers who sold for less than they paid (or 70 that sold for more than they paid). “We are stricter with credit scores for buyers,” he said. “Our limit is 660 to 670 from FICO, while the F.H.A. will take lower, maybe down to 640. We also have tightened the debt-to-income ratio; we keep it at 45 percent of buyers’ projected income, and F.H.A. will keep it at 55 percent. But 5 percent money is out there, it is widely available” among banks. Nearly four out of every ten homes sold in 2011 have been purchased for cash on the barrelhead, according to a preliminary count by Housing Intelligence. Despite record low mortgage rates for most of the year, 38% of all homes sold will be all greenbacks, no mortgage involved, HI reports. That’s up from 34% in 2010 and double the rate of all-cash deals recorded in 2006. And the trend is likely to continue, at least in the near term, the research wing of the Hanley-Wood publishing company suggests, as long as investors continue to take down a big share of the properties for sale, especially in which the previous owner was in some sort of duress. For the record, 20% of all housing sales in 2007 were for cash. In 2008, the figure jumped to 26%. And in 2009, it moved up again to 31%. How did we do around San Diego County in 2011? I haven’t come across one buyer yet who had to pay cash because they couldn’t qualify for a loan. A couple of comments were left yesterday regarding the financial stress among Carmel Valley homeowners – people who are under-employed and burning through 401k accounts to survive. How many homeowners are stressing in 92130? The data isn’t readily available, so you have to use your imagination. Let’s extrapolate – there are 68 SFRs in 92130 that are currently on the NOD or NOT lists. Doubling that makes another 136 who are delinquent, and 68 + 136 = 204 houses in trouble today. If there are a rolling 200 houses or so on the distressed list, we should be fine. There were 58 detached short-sale or REO listings that sold in 2010, and 61 have already closed this year. So if we’re ramping up to 70-90 distressed sales per year, and we keep selling 300+ total houses each year, the blend should be tolerable. The servicers will dole out the free rent as needed, push for short sales, and regulate the flow to keep the balance. Hopefully. If a renegade servicer floods the market, then we’ll get to test my theory that prices could go up. According to the tax rolls, there are 9,647 SFRs in 92130, so the 204 makes for roughly 2.1% of Carmel Valley homeowners that are now at risk of losing their house. What about the under-employed that are still making their payments, but whose time/money is running out? Plug in your own guess as to how many people are in that category, but first let’s note that probably 10% of the houses don’t have a mortgage – so let’s use 8,682 for those SFRs with mortgages. Unemployment in San Diego County is roughly 10%, but counting the under-employed, let’s use an arbitrary factor of 20% who will have to sell (assuming none of them can find enough work in the coming years). 8,682 x 20% = 1,736 houses with mortgages that could be distressed. To predict how long it could take to clear 1,736 distressed sales, let’s examine how many of the recent sales have been distressed, or somewhat-distressed. There were 35% of the total sales that we can call distressed, but just because you had equity doesn’t mean you weren’t feeling it. There were 32 of the 72, or 44% who sold for a loss, so even if they had plenty of equity they must have had some duress to sell for less than they paid. I think we can say that at least a third, and probably half of the current sellers are under some pressure to sell. There have been an average of 35 houses sell per month this year, so let’s call 17 of those at least somewhat-distressed. If there are 1,736 to work through, then 1,736/17 = 102-month supply – or 8.5 years to clear the market. Homeowners in CV tend to hang on as long as possible, and with the generous free-rent programs being employed by the can-kicking lenders, will the next 5-10 years be an orderly marketplace? I think so – I think half of the recent sellers probably needed to sell, and not only have sales been orderly, the pricing has held up too. Once the stronger hands have replaced those forced to move, it will leave a solid marketplace full of long-term residents who probably won’t be thinking much about selling. An interesting note while counting the number of houses – 64% of the carmel Valley SFRs were built prior to 2001. Generally there is no correlation between age of home and distress, but CV is known for it’s long-time owners. How many of those with plenty of equity will be leaving town in the coming years, and add to the supply? Are there enough buyers who are willing and able to keep paying this year’s average $329/sf? Of the 72 buyers, there were 17% who paid all-cash, which is about the same as it’s been lately. Financing terms today are extremely attractive, and the relative shortage of quality inventory could be masking actual demand. Will the troubles around the world permeate into the better markets and undermine sales and pricing, or drive a flight to quality? Natural disasters, civil unrest, political ineptitude, etc. could all cause a meltdown, but just a slow, but steady descent in pricing could cause more defaults by those who are comfortable now. If you are the type who worries a lot, you can let your imagination go crazy in Level Five. As long as there are buyers willing to maintain the current levels of sales and pricing, we should be able to work through the distressed sales as they are dripped out to us – keeping us at Level Two. Should the servicers cut loose and increase the foreclosure activity by 25% or more, and flood the market with additional short-sale and REO listings at very attractive pricing (under today’s), we could see a surge in sales – if there is pent-up demand. But who knows how crazy it could get with today’s political climate – did you see the opinion piece in the WSJ suggesting that Obama should decline a second term, and let Hillary Clinton be the candidate? The original thought behind examining the size of down payments was to get a feel for the buyers’ intentions – figuring that if they put down a healthy chunk of change, that they probably planned to live there long-term. But it also helps illustrate who is buying – people with substantial funds available. So far this month, 44% of the buyers are using at least 30% down payments on very expensive properties. Yes, the lenders are demanding bigger down payments, but the fact that people have the dough, and are willing to invest it in spite of the headlines, is a healthy sign. It helps identify the competition for the top-quality properties too – where you will likely be bidding against people with ample horsepower. Strategize accordingly.